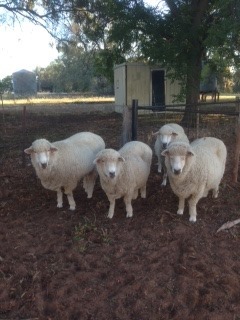 To the four of you, Abbey, Amelia, Bunyip and Bella, some of our best ewes, we wish you a very happy mother’s day. Just to fill you in, between them they have produced five stud sires, eight Grand Champions, three Reserve Champions, and have contributed five sheep into our show teams, over the years. Over the last five years they have lambed 175%. And every year they grow eight kilos of wool. These Aussie Corriedale girls supply the nation with fibre and food and I have to say seem to enjoy life to the full. And they’re ready to do it all again in June.